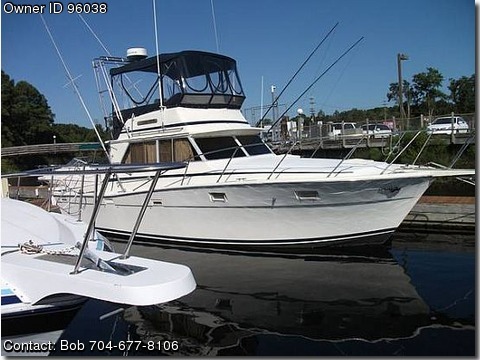 Contact the owner Bob @ 704-677-8106.Updated 1977 Viking Sportfishing/Live Aboard/Cruiser for sale. Serious buyers only and the first $19,000 offer gets an awesome boat to cruise, fish or use as a floating condo. Twin 454 Crusaders, new prop shafts, cutlass bearings, rudder shafts, heavy gauge wiring, Racor fuel filters, new flybridge canvas, outriggers. Due to health concerns, Owner offers you a great value with all electronics and fishing gear included. Housed at Myrtle Beach Yacht Club. Accommodations include A/C, hot water heater, V-berth, overhead rod storage and rods, marine toilet, walk-in shower, kitchen, 2 Lazy Boys. Call Bob at 704-six, seven, seven-8106 or 704-five, three, four-5080 for more info and to schedule a viewing.